Work: Speaker of the Rhode Island Assembly, (circa 1750-2); Delegate to the Albany Convention, 1754; Member of the Continental Congress, 1774-78; Member of Rhode Island Legislature. 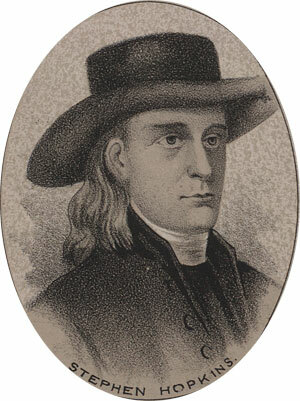 Stephen Hopkins was born in Scituate (then a part of Providence), Rhode Island, on the seventh of March, 1707. He was apparently self-educated. He was a member and speaker of the Rhode Island Assembly, and in 1754 was a delegate to the Albany convention in New York were he considered Franklin's early plan of Union. Hopkins spoke out against British tyranny long before the revolutionary period. He attended the first Continental Congress in 1774, and was a party to the Declaration of Independence in 1776. He left that congress in 1778 and returned to his native state to serve in its Legislature. He died on the 13th of July, 1785 at the age of 78.